In the autumn, if you snoop around a goldenrod grove, you’re apt to come across the ootheca of the Praying Mantis. You might want to bring it home and put it in the freezer. Mantises love goldenrod. When it’s blooming, they perch near the flowers and prey upon the wealth of visiting insects, enjoying their last meals before the cold kills them. “Mantis” means “prophet,” and as they sit motionless with forelegs folded, they seem to be in a religious trance. 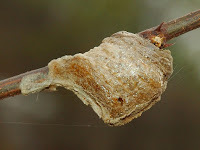 Before departing this world, the female will often use the goldenrod’s stiff stalks to attach one or more oothecas, the cases that hold the eggs until they hatch the next spring and provide a new season of mantises. So for some natural pest control next season as well as some insectival entertainment, put some oothecas in the freezer. Take them out next spring, put them in the garden to hatch, and watch the prophets pray for prey.